Heat oven to 400°F. Spray 15x10x1-inch pan with olive oil cooking spray. Remove fat from pork. Spray pork with cooking spray; sprinkle with 1 teaspoon of the rosemary, 1/2 teaspoon of the salt and the pepper. Place in center of pan. In large bowl, mix carrots, onion, garlic powder, the remaining teaspoon rosemary and 1/2 teaspoon salt. Arrange vegetable mixture around pork; spray vegetables with cooking spray. Roast uncovered 1 hour to 1 hour 30 minutes or until meat thermometer inserted into center of pork reads 155°F and vegetables are tender. Remove from heat; cover with foil and let stand 10 minutes until thermometer reads 160°F. Slice pork; serve with vegetables. 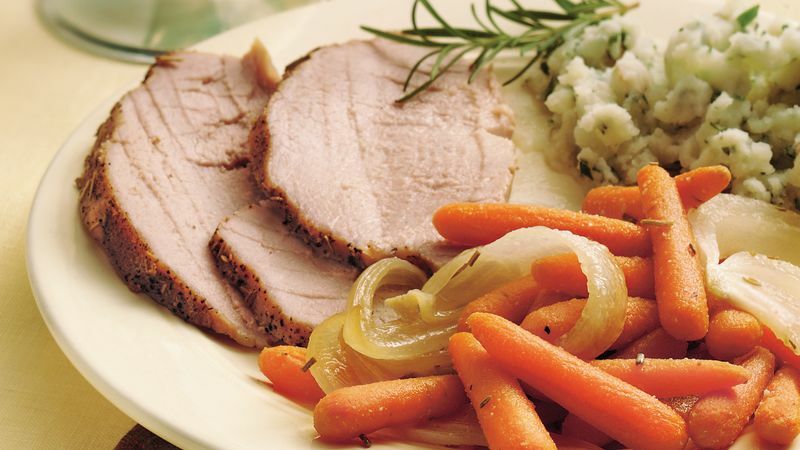 Pork loin is a lean protein choice. Protein supplies amino acids that give structure to the body in skin, cell membranes and muscles. Angel food cake with sliced fresh peaches makes a tasty dessert after this dish. Letting the pork roast stand 10 minutes before carving helps retain the juices. Questions about roasting meat? Check out our Timetable for Roasting Meats to have them answered.